SunBody Hats - Palm River Open Crown. Reshapable 4" Brim, 5-1/4" crown. SunBody Hats - Low Crown Gus Hat. 4" Brim, 5" Crown (creased) Gus. Guatemalan standard palm. SunBody Hats - 5" Gus, Medium Crown. 5" Brim, 5-1/2" Crown (creased). Gus crease. Guatemalan standard palm. Also available in 3-1/2",4" or 6" brim. Sunbody Hats- 2-1/2" Brim. 5-1/2" crown. Rolled brim, wide grosgrain hatband. Guatemalan Fine Palm Derby. 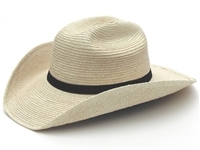 SunBody Hats - The Sam Houston hat. A style worn by the father of Texas, Sam Houston. A favorite among re-enactors of the Old South and the 1830's Texas. 5" Brim, 5-3/4" crown creased down to 4-1/4". Gambler Crease w/pencil roll. Also known as a Planters or Plainsman Hat. Popular in the 1780's-1840's, even up to the Civil War 1860's. Guatemalan standard palm. SunBody Hats - Crazy Horse Palm Leaf Hat. Distressed, suede-laced hatband. 4" Brim, 4-1/4" crown.